Green Goods proudly manufactures our own brand of modern interior doors. Green Leaf Doors are inherently green, exotic in nature and rich in design. Combining beauty with exceptional durability, our doors offer an architectural design element that is timeless and unique. Doors are available in bamboo and FSC Echowood veneers including fir, white oak, walnut, teak, cherry and other exotic and unique woods. 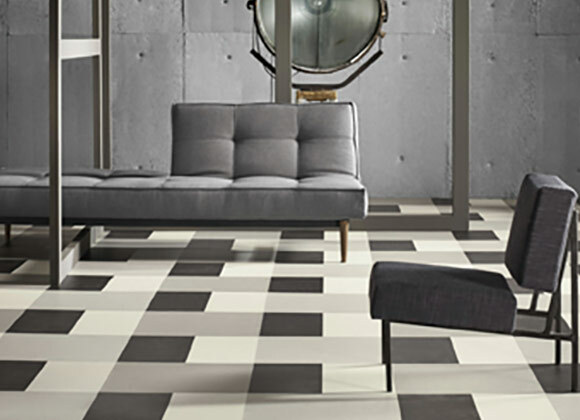 Collections include contemporary flush doors with metal inlays, traditional stile and rail doors, french doors and our one of kind Designer Collection. 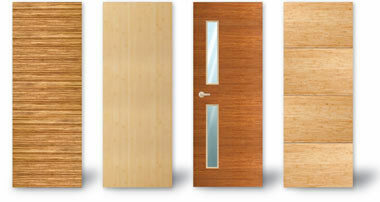 For more information, visit www.greenleafdoors.com. Stile and rail one panel, horizontal grain amber bamboo door. Straight and clean lines are the signature of this door style. 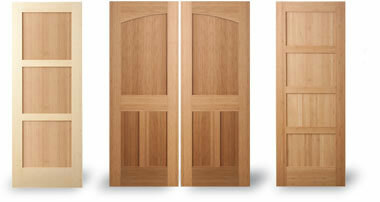 Available in a variety of panel options – arch top, square top and continuous arch double doors. Additional “plant on” decorative edges provide an elegant detail to enrich your door. 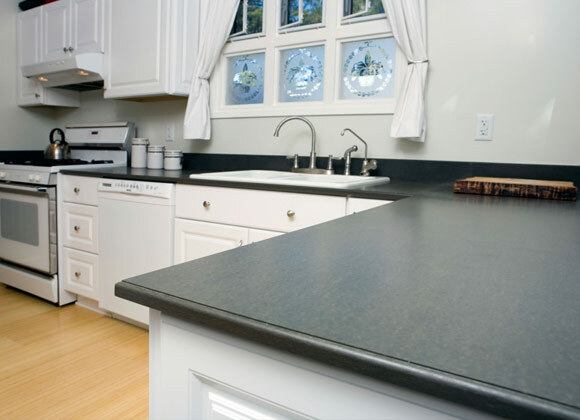 13 panel options available in all colors and grain pattern. 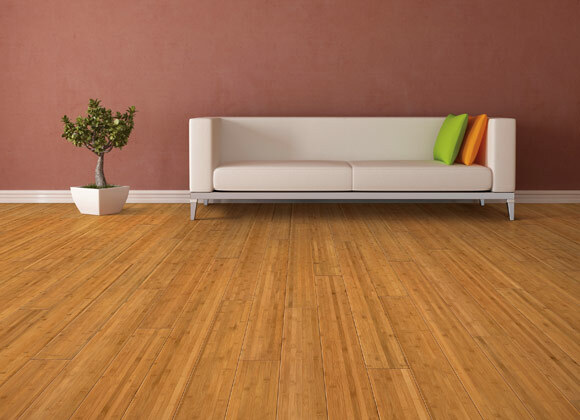 Standard horizontal and vertical grain bamboo in natural or amber color are available. Woven strand can not be applied to Stile and Rails. Inlcude standard bamboo as well as woven strand variations. Glass and louvers are options as well. 36" x 80" - custom sizes and configurations available. Stile and rail two panel, vertical grain amber & java bamboo door. 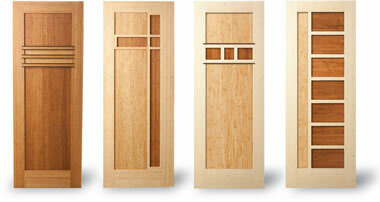 Flush three panel, horizontal grain natural bamboo door - with stainless steel inlays. A completely smooth door engineered from quality kiln-dried hardwoods and water resistant plywood. 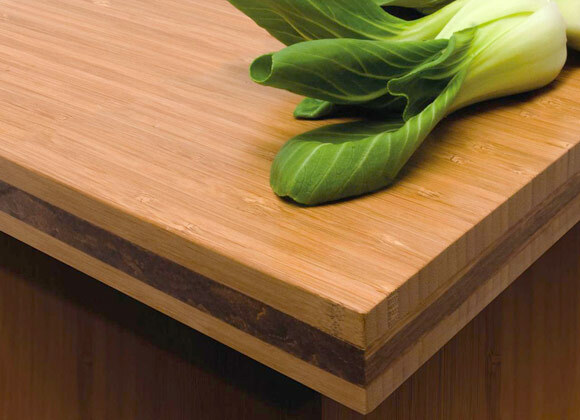 Bamboo grain can run vertically in a single panel or horizontally in multiple panels. Available as a solid core, with custom light kit options. Stile and rail three panel high, vertical grain amber bamboo door. Stile and rail two panel mid, horizontall grain natural & java bamboo door. Flush one panel, vertical grain natural bamboo door - with 2 offset windows. Flush five panel, strand woven natural bamboo door - with brass inlays. Flush five panel, strand woven java bamboo door - with brass inlays. Flush one panel, vertical grain amber bamboo door - with 3 centered windows. Olas flush designer one panel natural strand woven bamboo door. Olas: Spanish for “waves.” Five horizontal bamboo panels divided with ¼” accents and then crossed with a vertical ½” metal inlay on the handle side. Tahoma flush designer one panel natural strand woven bamboo door. Tahoma: Navajo for “waters edge.” This door features two vertically facing bamboo panels that are split by a horizontally facing brushed metal panel offset at handle height. Tugun flush designer one panel amber strand woven bamboo door with stainless inlays. Stile and rail three panel T mid, horizontal grain natural bamboo door with glass. Tugun flush designer one panel horizontal grain natural bamboo door with brass inlays. Yanba flush designer one panel horizontal grain natural bamboo door with java band. 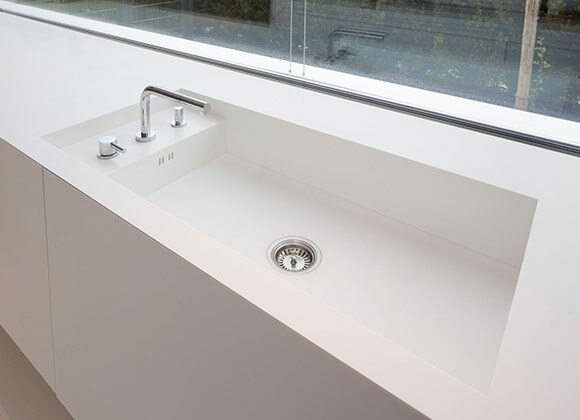 Yamba Flush is similar design to Yamba stile and rail door with the band reaching the edge of the door. French one panel vertical grained amber bamboo door with plantons. 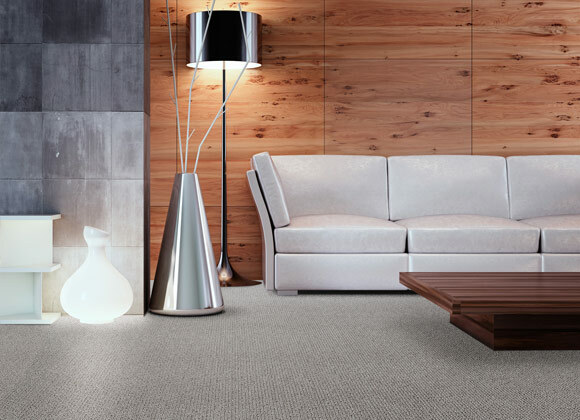 Designed to bring natural light and warmth into your home. An elegant style of French doors is amiable in many design options. 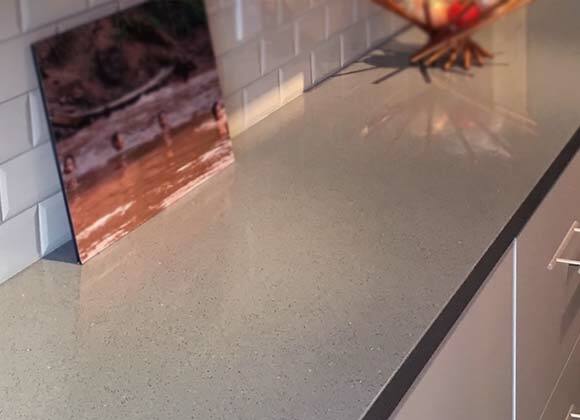 The addition of art glass, recycled resin panels or etched glass can add an extra splash of color and texture. 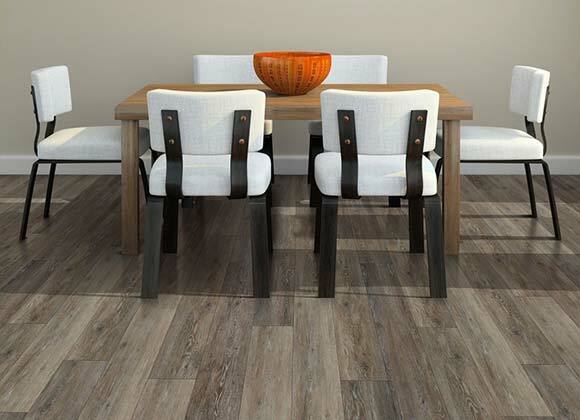 9 panel options available in all colors and grain pattern. There are 7 standard choices of glass available. French three panel arched horizontal natural grained bamboo door. French three panel vertical natural grained bamboo door with plantons. French four panel horizontal natural grained bamboo door. French seven panel vertical amber grained bamboo door.